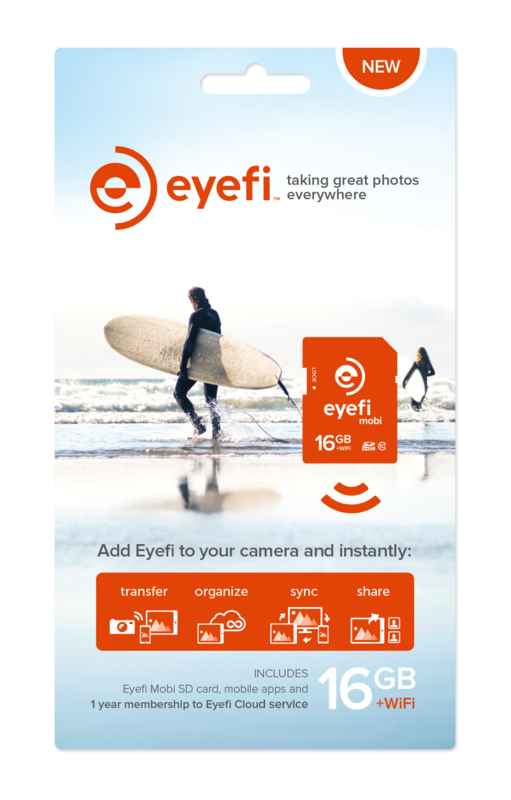 Eyefi, the maker of wireless SD camera storage cards and mobile device companion software, has inked a deal with Best Buy to offer customers an exclusive hardware-cloud package. It features the Eyefi Mobi 16GB Wi-Fi SD card paired with a one-year membership to the company’s new Eyefi Cloud service. Eyefi Mobi, a class 10 memory card, is compatible with thousands of cameras from Canon, Nikon, Sony, Olympus, Fujifilm, and others. Eyefi Cloud, which was launched last month, makes newly shot photos immediately available on smartphones, tablets, desktop computers or smart TVs, but emphasizes private photo sharing and strict user control over who sees your images. The service automatically organizes new shots in any resolution. Apps for iOS, Android, and Kindle are free and available in the iTunes, Google Play, and Amazon stores. The cloud service, paired with the mobile apps, lets you further manage and share images. The bundle is available online and at more than 900 Best Buy retail stores for $99.99, a savings that Eyefi estimates to be about $15. Purchased separately, the 16GB card lists for $80 on the Eyefi site, though prices vary, and includes a free three-month subscription to the cloud service. After that, the cloud service costs $49 per year.